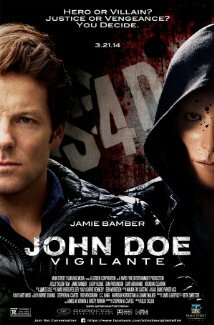 Written by Stephen M. Coates and based on a story created by himself and director Kelly Dolen, John Doe:Vigilante poses the age old question; do two wrongs make a right? Is revenge ever appropriate, justified or emotionally cathartic? How far would you be willing to go for justice? Well, if you're John Doe, infamous serial killer who videotapes his kills and then requests an interview with an uber popular journalist, you will go to any length to try to fill the hole in your heart. Wearing a decidedly creepy mask, John Doe kills criminals. Much like Dexter Morgan, he kills only people who have no remorse for their actions. If you have committed a crime, paid your debt and your penance, you're safe. If you're just a giant jerkface and don't care about how your actions impact innocent people, well, you're going to die. John Doe is going to kill you, videotape it and then the public will watch it like another piece of primetime television while cheering him on. O.K, not everyone thinks that what he is doing is admirable, but the majority do and they even end up creating their own John Doe groups. Like Fight Club, but killing people instead of just punching them. And this is where things really get messy. Clearly, you cannot have a bunch of people going around dolling out their own brand of justice; this is not Game of Thrones, people. Besides that, most people quickly learn that killing and maiming isn't for everyone. John Doe truly is performing a super bizarro, morally questionable public service. He's taking out the trash, he's efficient, he's skilled, he looks good doing it and he likes it. Or does he like it? Everyone knows that, "killing is easy, it's the living with it that's the hard part." As the world navigates it's thoughts and feels about John Doe via the always entirely reliable news programs, we learn the various in's and out's of his story, how he came to be a serial killer and how he became a questionable hero of sorts. A lot of the revenge violence in the film is focused oo pedophiles and that's always a super easy cause to get behind, but some of the violence is really very brutal. It's not gratuitous violence, but very real looking and sounding and it's quite unnerving. John Doe's final murder occurs live via an internet feed and everyone is watching. Electronics stores full of people have all of the t.v. 's tuned in to watch John Doe confront an especially disgusting perpetrator and it's certainly an interesting comment on our collective desire to watch violent things happen. Are we not somehow complicit in the act if we watch it the same as we watch a football game? That's the thing with John Doe:Vigilante; it brings up so very many moral conundrums that it becomes a bit too much to take all of it in and you start to feel a victim of John Doe yourself. His moral grandstanding reaches an epic level when he speaks directly to the camera and reminds us that we're all John Doe, therefore, we all have culpability in ridding the world of vile garbage. Perhaps if the movie was more on the action/thriller side of things and less on the dramatic/preaching side of things it would have felt more like an awesome thriller with something to think about rather than just feeling I had been subjected to proselytizing with a side of violence.